Nope. Only if a rooster has been in the “company” of a hen. 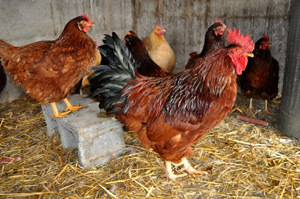 Usually, one rooster can “service” approximately ten or so hens. Roosters are necessary only if you wish to hatch chicks (of course, they’re also beautiful to have around). You mean a hen will lay an egg that’s unfertilized? Yep. In fact, that’s how it happens in, I’d say, most of the commercial egg “battery cages.” See our egg in the dish on the left? Note the blastoderm. That’s the little concentric circle in the yolk. It’s indicative of a fertilized egg. The egg on the right is one I purchased from the grocery store (hadn’t done that in years). 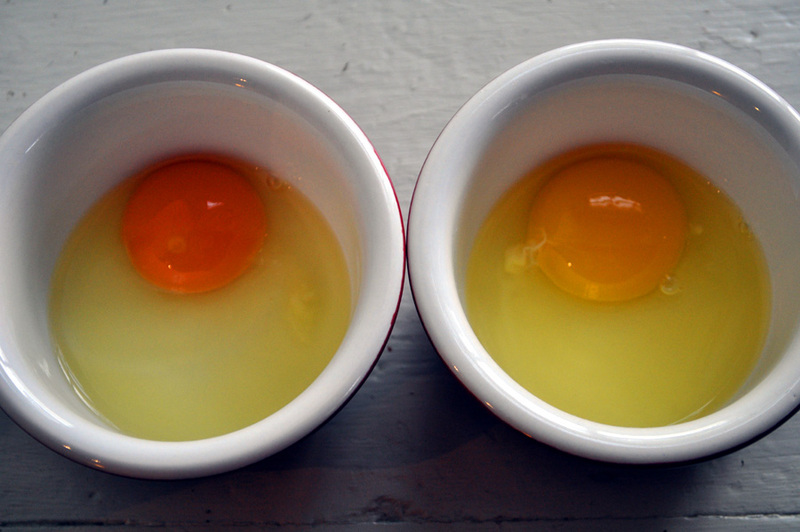 Why are the yolks from your chickens so orange-ish? We feed our chickens “feed corn” purchased from a local farmer and supplement with “layer” feed. They are free-rangers (given access to come and go as they please) and are outdoors from sun-up to sunset. I say: orange-yellow yolk equals happy hen. What are the white squiggly things attached to the yolks? 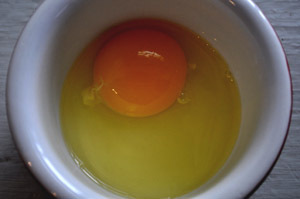 The chalazae are on either side of the yolk, stretched tightly, to anchor the yolk to the shell. They recoil against the yolk and “squiggle” when the shell is broken. There is no harm in eating the chalazae. Are brown eggs better for you? Unfortunately, I just read that some white shells are dyed brown (news to me?!) because consumers believe the brown shell means a healthier egg. I can’t find any evidence to support this. I will tell you a chicken with white lobes (they look like earlobes—if chickens had ears) will lay white eggs and a chicken with red lobes will lay brown eggs. There are a few exceptions to this. The most noteworthy is the green-blue egg laying Auracana (but that’s another blog post, altogether). Hawks are routine aerial visitors to our place. We have many chickens in the barnyard and about a third of the group tends to free-range, flying out of the enclosure in the morning and back in the evening. 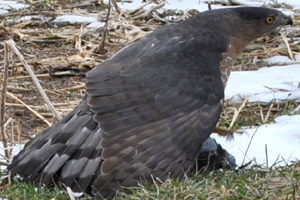 You can imagine the “alarm system” that goes off when a hen or rooster spots a circling hawk. It really is quite amazing. The immediate group will stand perfectly still while their heads are cocked toward the sky to spot the predator. 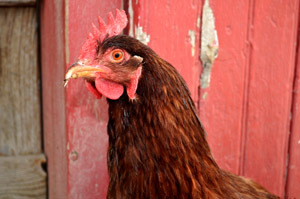 The “cry” is unlike any other sound a chicken will make. In the warmer months, I’ll even stop what I’m doing in the yard to see if I can spot the hawk! Hawks are so brazen, they’ll fly into the barn through an open window (I say this because the entryway doesn’t have to be big; if they want in, they’ll get in) and seek out a meal. The other day, it was a pigeon. 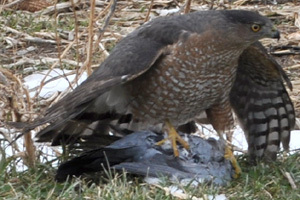 This particular Sharpshin managed to get a pigeon and heave it to the outskirts of the vegetable garden. He sat there for a couple of hours, feasting, and when I slowly made my way to take pictures of this stately bird, he flew off—clutching the pigeon—and alighted atop a tree hundreds of yards away. Since I used to pilot aircraft, I have a professional appreciation for what I had witnessed. 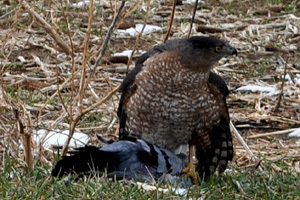 Although the hawk had wingspan and girth on the pigeon, to take flight immediately from a “still” position, carrying cargo? Jaw-dropping. Which is exactly why I couldn’t get the camera up in time to snap a picture—I was too busy processing what I had just seen. Tracy visits Oley Valley Feed, a local feed store, and picks up several important tips on proper watering of livestock in winter. Unbeknownst to us, a few nights ago (on the coldest, windiest night of the year thus far), we lost the heat lamp on the chicks. It happened in the middle of the night. Fortunately, the “chicks” are about 6 weeks old right now and have full sets of feathers. 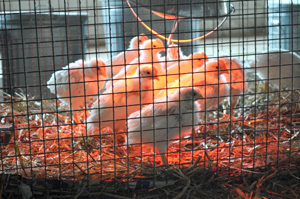 Typically, if you have chicks in the Spring the heat lamp is kept on them until they develop feathers and/or the weather is warm enough to sustain them, whichever occurs last. Raising chicks in the winter is a different story. You might need two heat lamps to provide the necessary heat in a situation that would normally require just one in warmer months and you’ve got to be wary of drafts. It’s also a good idea to have an extra bulb on hand at all times. The heat must be provided around the clock; even newborns, kept in the house, might not have enough heat to sustain themselves without the use of an infrared bulb. These were the babies that came home with my daughter from school (fourth-graders hatched the chicks using incubators) at the tail-end of Fall—not exactly the ideal climate for raising chicks! Chickens are an endless source of entertainment. I was late one morning getting to the barn and opening the coop so everyone came charging at me when the doors were finally opened. I always feed the chicks first and then move on to the mature birds. 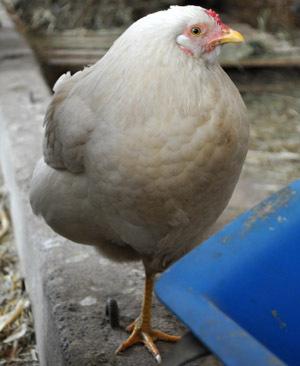 When the bag of crumbles rattles, mature hens hop on top of the can and plop themselves into the feed bag as fast as they can. We have so much hay in the barn. There’s a mound of loose hay David picked up and it rests next to the bales. The chickens LOVE to pick through it! They’ll scratch and hunt all day long in that pile, I’ll sweep it back up at the end of the day, and the next morning it’s scattered. And one of these days I’ll video some of the action that goes on between two hens arguing over the same nesting box (again, we’ve plenty of laying boxes to go around but many choose the same one). 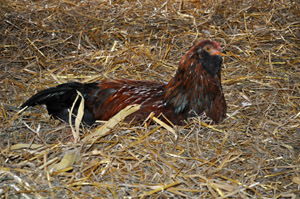 Hens can be quite vocal with one another when it comes time to lay. Our host, Tracy Toth, continues our tour with Leon Moyer of Moyer’s Chicks Inc., a hatchery in Quakertown, Pa. If you missed it, click here to view Part One of this webisode. A trip to a hatchery! I’ve wondered about these magical places ever since our after-hours pick up of our first box of day-old chicks from the local post office (and I bet you thought chicks came from hens). Leon Moyer, co-owner (with his brother, Ivan) of Moyer’s Hatchery in Quakertown, Pa., gave us the grand tour! We witnessed each stage: the uncrating of the eggs arriving from southern egg farms, the placing of the eggs onto trays ready for the incubator, the carefully-timed rotation of the eggs (mimicking mama’s instincts), the transfer of the eggs to “baskets” readied for hatching chicks, to the boxing and shipping of the new babies! The Moyer family is one that has always believed in a commitment to community (which was the biggest reason Leon’s father wanted to begin his agricultural-based business in the late 40s). Leon, his brother Ivan, and their families have carried on their father’s tradition. 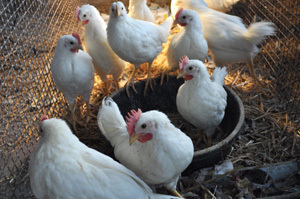 The Moyers have reached out internationally to contribute to communities around the globe, spending years helping people to develop poultry operations in Bolivia, Haiti, and Uzbekistan, to name a few. I was very happy to have had the pleasure of a hatchery tour…and very proud to have met such a generous person. Thank you, Leon! 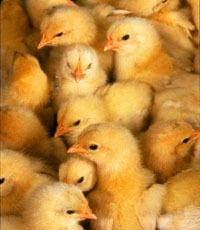 Our host, Tracy Toth, takes us on a tour of Moyer’s Chicks Inc., a hatchery in Quakertown, Pa. In this webisode we learn that at the hatchery, the egg definitely comes first. The tour is a two-part webisode. Click here to watch Part Two. 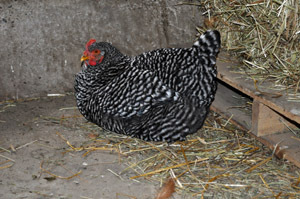 We have a stunning Barred Rock rooster that free-ranges with his “girlfriends” — about 5 or 6 hens. He has learned that, if the mudroom door is open and he sees human movement beyond the screen door, a loud crow of his will be summarily “answered” with a slice of bread. This morning was no different.